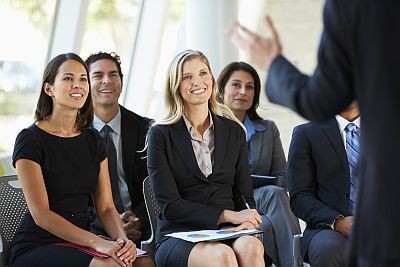 Giving free speeches to professional and community organizations will generate visibility and build your reputation as an expert, helping you to grow your business. But you can also make money – directly and indirectly – from speaking for free. First, create or obtain products you can sell after your talk. If you do not already have your own products to sell, the fastest way to do this is to buy products from someone else. For example, if you are a expert on personal security, you could offer a few security devices (such as hand-held alarms or pepper spray). You can also develop information products. Put together booklets of personal security tips for women, security for travelers, keeping your home secure, etc. They don’t take long to write, and can be produced in small quantities for about $1 each. Additional information products would include books, posters, audio and video, t-shirts, etc. An audio program can be created simply by recording one of your talks. Always provide a handout when you speak. One page is fine. Include some of the important points from your talk, or some tips related to your topic. Make sure you include information about how you can be contacted. On the back, put a brief bio and/or information about your products and services. Include a special offer or coupon, with an expiration date, to encourage the audience to contact you. After you have been speaking for free for a while, you will get asked about your fee to speak. This opens the door to a whole new set of opportunities. If you are asked about your fee for speaking, it means you are ready to become a professional speaker – a professional expert on your topic.